I recently read three different articles that all had a very similar message. It was essentially this: there is a limit to knowledge and intellectual thought, and some answers may not be found that way. I’ve written about this before, but there is always more to say. We’ll see why, below. 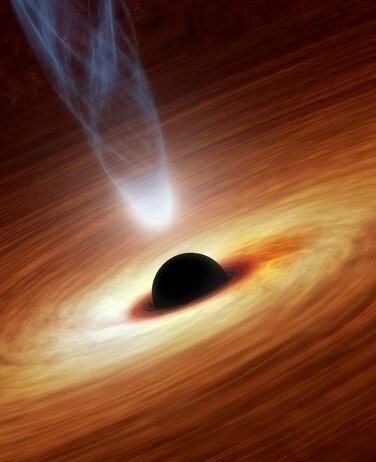 Artist’s impression of a black hole. The first article was by Martin Rees in The Atlantic called “Is There a Limit to Scientific Understanding?” In response to his question I would ironically say, “I think so.” Rees agrees. …reach the limits of what our brains can grasp. There might be concepts, crucial to a full understanding of physical reality, that we aren’t aware of, any more than a monkey comprehends Darwinism or meteorology. Some insights might have to await a post-human intelligence. What is “post-human intelligence”? That’s a very transhumanist term. Will there be a time when we may no longer consider ourselves humans but rather post-human? I think it is simply intelligence greater than we have now. If we were to ask people a hundred years ago what they think of humanity today, they might think we were far more than human, perhaps even Gods, with our ability to travel nearly anywhere on Earth in less than a day, how we’ve walked on the moon, roamed around Mars, and have entire libraries of knowledge, no, the whole world’s knowledge, accessible with our fingertips via a small black slab in our pockets. As the saying goes, the teenager today in Sub-Saharan Africa has access to more information than the president of the United States did just 25 years ago. But even with all of this profound storage of knowledge, I think greater understanding will come with higher forms of consciousness that take emergence from complex systems and holistic perspectives of reality much more seriously. Not everything in the universe is reducible to smaller and smaller particles and finer and finer forces, or even greater and greater knowledge. Sometimes we can’t see the forest for the trees. In fact, if we zoom into a single ribosome in a cell on the trunk of a tree, we can’t see the forest at all. It becomes invisible to our perception. So too, all our great human knowledge may blind us. Many scientists are focusing on smaller and smaller phenomena, believing this will unveil the inner workings of the universe. But perhaps greater understanding will come from taking a step back and considering the whole, taking whole systems on their own terms. Even then, I think there is a limit to human intellectual understanding. What is “intellectual” understanding? It is the kind of understanding that we can grasp in ideas, concepts, words, phrases, books, and libraries. In other words, it is what our thoughts consist of, our reasoning ability. I think some things will not ever be able to be expressed in words or equations, proofs and treatises. Can we ever describe love fully in even the most exquisite poetry? Could we ever describe love with calculus or physics? I don’t think so. I think our human evolution will continue by taking seriously the intuitive, holistic, creative, emotive, aesthetic, relational, interconnected, emergent, unitive, experiential qualities of Life. These often go far beyond the capacities of our intellects, concepts that the left hemisphere of the mind can’t grasp, it seems to me. We will need to get much more comfortable with the transrational and the transpersonal qualities that might be intuited more in the domain of the right hemisphere of our brains, and throughout the whole of our bodies and communities. I think we will become more aware of a Mystery in the universe that cannot be fully understood, defined, or explained in rational or logical terms. That is why it is called a “mystery,” even since ancient times, even the “mysteries of God” or the “mysteries of the kingdom,” it seems to me. It will be intuited directly, experienced in order to be known (gnosis), rather than known through most of today’s common channels of learning and knowing things, what we might call “book” knowledge. It’s the difference between “conocer” and “saber” in many Romance languages. We haven’t maintained that distinction of two different ways of “knowing” in modern English, to our detriment. Love must be experienced to be truly known. It can be fully known in no other way. We may notice that “Love” is one of the names of God (1 John 4:7-8 BHT). My photo of the stacks at our local Midtown Scholar Bookstore in Harrisburg, Pennsylvania. A few days ago my wife and I walked through the many rows of books at our local Midtown Scholar Bookstore in Harrisburg, Pennsylvania. 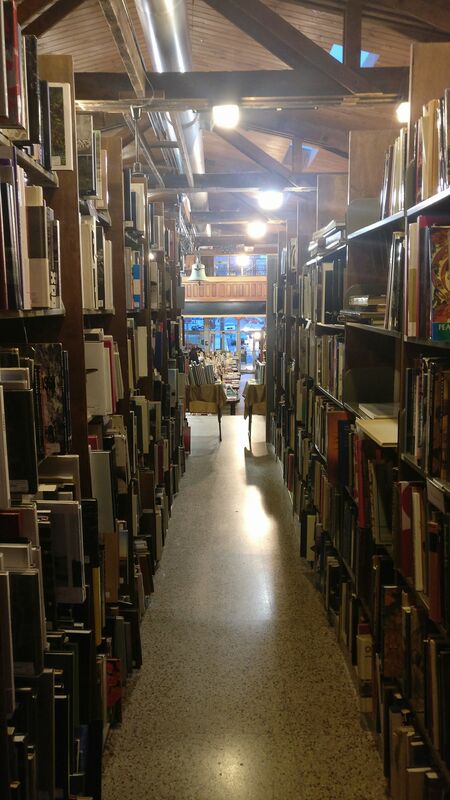 It is a very lovely bookstore, with books on every subject, including some very old and rare books. I was overwhelmed by the presence of so much knowledge, that could never possibly all be read in an entire human lifetime, and posted on Facebook as much: “Behold! The world’s knowledge!” I currently have over 1,108 books on my own to-read list, and I know I will never be able to read even these. It has been discovered by many that the more you know, the more you know just how much you don’t know. Learning and being in the presence of so much knowledge that you will never know drives you to a profound intellectual humility, that there are many things that you will simply never know, and can’t know. It is beyond the capability of the human brain or body to know it all. It may even lead you to know that much of what you think you know now is likely wrong! And yet we still have many people today that scour the libraries looking for that key of knowledge that will reveal all things. Some seem to think that the more they read, the closer they will grow to the truth, until eventually perceiving Truth itself, perhaps even God. In Hinduism this might be called Jnana Yoga, the path of wisdom. For some this works, but perhaps not in the way that we may think. There are limits to such worldly wisdom. It is not the accumulation of knowledge in our minds that eventually leads to the breakthrough to God, I perceive, but the eventual surrender of one’s intellectual self in the realization of immensity of all that one does not know, and can never know. That is when the veil parts. Could we read and comprehend all that has been written from the days of Adam, on the relation of man to God and angels in a future state, we should know very little about it. Reading the experience of others, or the revelation given to them, can never give us a comprehensive view of our condition and true relation to God. Knowledge of these things can only be obtained by experience through the ordinances of God set forth for that purpose. Could you gaze into heaven five minutes, you would know more than you would by reading all that ever was written on the subject. And yet many of us search for God in books, thinking that if we read enough, we’ll eventually find God. We don’t understand that God is found through experience, which is far more than has ever been written. …it is a well known psychological fact that it’s the most incompetent who are the most confident of their abilities and the most intelligent who are full of doubt. (Really, it’s called the Dunning-Kruger effect). It’s equally well established that the more readily admit you don’t know things, the faster you learn. Yes, fully admitting and realizing you “don’t know” actually allows you to learn faster and become more intelligent than thinking you “do know.” If we follow this to the end of the row we may discover that we can only come to know God if we surrender all of what we think we know, even our very understanding of God. Again, it sounds strange and backwards, but it is real. Only by surrendering all of ourself, can we come to know God. The third article that I read was Umair Haque’s “How The Way We Think About the World Failed.” Haque’s premise is that intellectual thought has failed the modern world. We cannot think our way out of our problems. We tried that, and it didn’t work. In fact, this brings up more problems than it solves, leading to arrogance, hubris, and pride. Haque posits that the institution of thinking itself has failed. Why do many people feel worse off today than fifty years ago? It’s not for lack of thinking! We’ve done plenty of that. People may be dumb (lacking information), but they are not stupid (without reason). People gravitate to those structures and communities where they feel most inclusive, most protected, most appreciated, most purposeful. It has nothing to do with how they think of those communities, but how they feel when they are within them. It is an emotional pull, an aesthetic tug, not an intellectual one. The mistake here is to suppose that happiness is a linear function of how much stuff we have. Of course it isn’t — even a child knows that more toys don’t lead to more happiness, often only anger, resentment, and guilt. If I gave you a bigger TV every day forever, would you really be any happier? Why are lottery winners unhappier a few years down the road than before they won the lottery? The purpose of life, at least in a small way, is a sense of fulfillment, realization, self-discovery, but that is bigger than pleasure, isn’t it? Yet, economistic logic flips all this on its head and demands that having had more stuff, we must feel this reductive, simplistic thing called “happiness”, or else we are stupid. That is why intellectuals are left powerless to understand why people feel the way they do, and end up only insulting them for not feeling the way their broken theories tell them they should. Well, what has the price of more stuff, faster, cheaper, bigger been? Truth, freedom, justice, dignity, and possibility — you only need to scan the fake news headlines about autocracy and poverty and so on to glean that much. The discontents of the broken social contracts of today are pressure, isolation, distrust, loneliness, anxiety, fear, anger at one’s own powerlessness to change it all. Trust in institutions and between people has imploded, loneliness crept into every corner of life, people work longer hours than ever, and so on. What does bring lasting fulfillment and contentment in life? Experiences. And not just any quick fix, mindless entertainment, but deep experience that leads to a sense of wholeness in society. That which brings true wholeness comes from experiences of love, trust, cooperation, community, caring, creativity, relationships, exploration, curiosity, wonder, awe, security, safety, hope, optimism, freedom. As Haque says, “contentment comes from really only one place: realizing more of one’s hidden possibility.” That hidden possibility that may be realized, I perceive, is God. That contentment doesn’t come from more and greater thinking, but more and greater feeling. Deeper and deeper and deeper feeling. Might we generate an economy that maximizes enduring and sustainable feeling and experience of Life? The underlying message of this work suggests that the way to know God is to abandon consideration of God’s particular activities and attributes, and be courageous enough to surrender one’s mind and ego to the realm of “unknowing”, at which point one may begin to glimpse the nature of God. Some will think that this essay, and the articles it links to, are very anti-intellectual, even anti-intelligence, in some kind of argument against being smart, and dismissing seeking knowledge and understanding in the world. That’s not it. It’s not that knowledge is inherently bad or evil, and that we should not educate ourselves and seek to use the knowledge we gain to do good in the world. We can use all human knowledge for very good purposes in the world, to create, to explore, to cure disease, to learn about our universe, and alleviate suffering. But we sometimes confuse human knowledge for God’s knowledge. God’s omniscience does not mean knowing all human knowledge, in my view, but rather it means God knows things as they really are, reality as it really is, which is Truth. Thy mind, O Man, if thou wilt lead a soul unto salvation, must stretch as high as the utmost Heavens, and search into and contemplate the lowest considerations of the darkest abyss, and expand upon the broad considerations of eternal expanse; he must commune with God. It wasn’t simply book knowledge that would stretch our minds in this way, but a breadth and depth of experiential knowing. In the story of Adam and Eve they eat of the Tree of Knowledge of Good and Evil (duality), and by so doing they Fall. This is called the “original sin” in much of Christianity, and is thought to be the cause of our suffering, separation, and estrangement from God. It was knowledge that got us here. Why do we think it is more knowledge that will bring us Home to God’s Presence? It seems to me that we must stop eating of that Tree of Knowledge at times, and occasionally give it up entirely, surrendering all that we think we know, if we wish to turn towards that Tree of Life in the center of the Garden of Eden and walk that road back to Life. We come back to Life by giving up that which revealed our Death. Does that seem at odds with society, with the status quo? Yes. It is. I want to see a New Story education, which is not only about intellectual knowledge – not only about measurement – not only about academic achievement. It is also about heart, feelings, emotions, relationship, love, compassion, generosity, beauty. All these values are part of the heart. Through neglect, ignorance, or inability the new intellectual Borgias cram hairballs down our throats and refuse us the convulsion that could make us well. They have forgotten, if they ever knew, the ancient knowledge that only by being truly sick can one regain health. Even beasts know when it is good and proper to throw up. Teach me how to be sick then, in the right time and place, so that I may again walk in the fields and with the wise and smiling dogs know enough to chew sweet grass. Whatever the intellectual quality of the education given our children, it is vital that it include elements of love and compassion, for nothing guarantees that knowledge alone will be truly useful to human beings. All human knowledge is illusory, in my opinion. It is relative truth, not Absolute Truth. Even this essay is only relative truth. It is a finger pointing at the moon, but it is not the Moon itself.